Blog: Elance allows buying fake Instagram followers! It seems that not only Twitter that was (and may be still?) affected by the suspicious software codes that can generate hundreds of thousands of fake followers to some Twitter accounts (i.e. Tamer Hosny's fake Twitter followers). Instagram had joined the club. 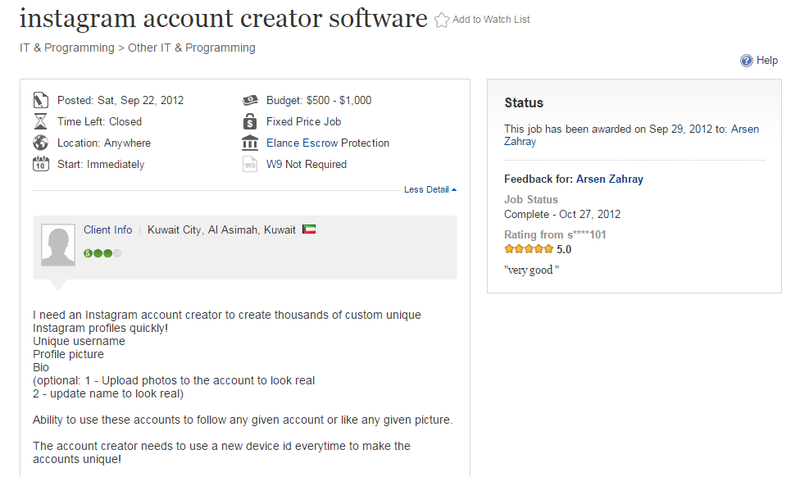 A Kuwaiti-based Elance employer had posted a job asking for software developer to create thousands of custom unique Instagram profiles quickly with ability to upload photos to the account to look real and update account name as well. The employer requests also allowing the created accounts (fake ones obviously) to follow any given account or like any given picture. Guess what! 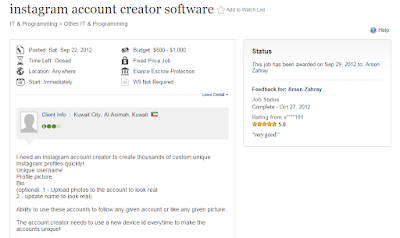 It took one month only for a developer based in Ukraine to deliver the software successfully receiving 5-star rating from the Kuwaiti employer (who posted another job asking for YouTube views). Social media platforms should be responsible as well. Facebook is actively updating page fans to remove inactive likes, etc (last time on March) while Twitter had removed hundreds of thousands of Twitter followers of Tamer Hosny after our post. What about both Elance and Instagram? Thanks for the information. It was helpful. Its really a bad idea to have fake followers and artificial views for your videos. Its really going to have a negative impact on us. So one needs to be careful. Anyway, thanks for this great information.